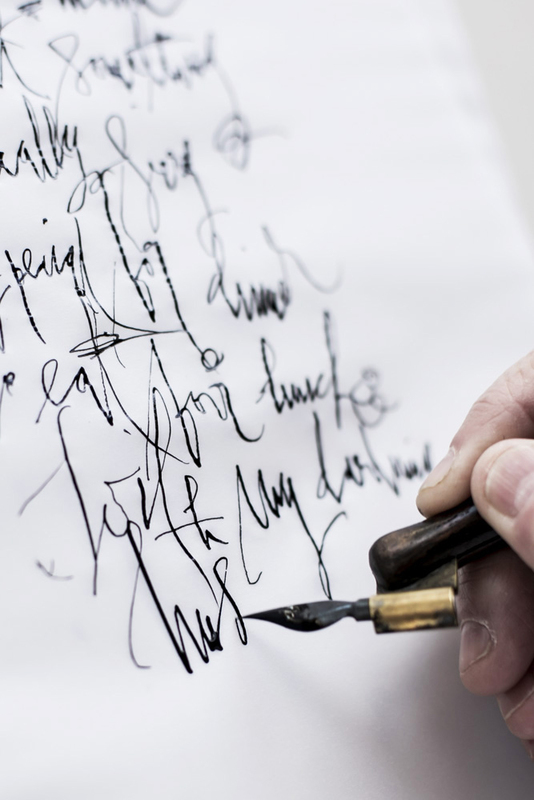 Each July in Melbourne the Calligraphy society of Victoria host a Summer school in Winter. Calligraphers from all over Australia, New Zealand (and occasionally even further afield) enjoy a three day workshop followed by a two day masterclass run by the tutor of their choice. SSiW’s goal is excellence in lettering and strength in teaching. The event has become a week long pilgrimage for letterform lovers where they can learn from the speakers and one-another, connect with community and indulge in all things calligraphic. The society explains the theme for 2016 was contrast. This years event sought to explore "attention to detail, without forgetting the bigger picture; seeing the details of a letterform or process, while considering the overall design" the 2016 line up offered a really diverse range of methodology and practice - mixing traditional approaches with contemporary/speculative and experimental work. I was excited to see Brody Neuenschwander was hosting one of the masterclasses. His expressive and gestural calligraphy is a visual treat, always dynamic, and always beautiful. This year three of my favourite calligraphers were attending and I enthusiastically followed the event via their instagram accounts. All three ladies opted in to Brody's masterclass where they worked collaboratively to layer text into texture "Focusing on rhythm, liveliness and using contemporary scripts" in a large format. What is it about these events that excites and interests you? Sabine: I have been a regular SSiW for the last 4 years. I love the fact the Victorian Calligraphy Society bring International tutors from around the world. And that I get to stay in Melbourne for 5 days! Barbara: This was my first year, I find that so hard to believe as SSiW has been going for 18 years. There were lots of silly ideas that I didn’t realise it was open to everyone not just Victorians. Anyway I did declare that it could and probably will be an annual pilgrimage, depending on who will be tutoring. Kate: This was my second year at SSiW. It is a really fantastic event, there is always a great line up of tutors, usually 3 or 4 international tutors and a couple of Australian tutors. There are 5 days of workshops split up with a 3-day workshop and a 2-day workshop. You can choose to do 3 days with one tutor and 2 days with another, or a full 5 days with one tutor. So much amazing work is produced over the 5 days and you learn so much from the workshops, other students and seeing what the other classes are up to. We just don’t have an event like this in New Zealand with such a high calibre of tutors and students all in one place so it is great to be able to hop across the ditch. The experimental nature of Brody Neuenschwanders workshops; sounds great from what I have seen and read he really gives you permission to play! What was the workshop culture like? What did you enjoy most about the experience? Sabine: I enjoy the chance to have up to 5 days immersed in something you love, I particularly loved Brody’s classes as he is so experimental and this appeals to my aesthetic. I am not the calligrapher that can sit down and learn all the subtle nuances of the letterforms. Kate: I signed up for Brody’s class without realizing it was an advanced class!! Besides one other girl who is the same level as myself, everyone in the class had been practicing calligraphy for 25+ years. Everyone was very encouraging and I learnt a lot just being surrounded by so many experienced calligraphers. Brody is a great teacher, the workshops were experimental but there was also a lot of discussion and critique about technique, often the styles that look the most dynamic are the ones written the slowest and with the most consideration. Barbara: I was so nervous before I went, being my first time and being amongst some calligraphy ‘big guns’ but once you start you just get into it and ride that wave (which is so good, everyday since I wish I was back there). Yes we had that opportunity to experiment, which is great and how you grow but it always had boundaries and working parameters. Once you had worked through these parameters then it started to fall into place. Of course some people were just way faster than me but I was so busy with my own journey it really didn’t matter to me. For me what I enjoyed the most was pushing my boundaries and Brody was so encouraging and gave lots of advise which was brilliant. Another thing I learnt which is invaluable and that was even if you want a piece to look like it was written fast you probably shouldn’t write it fast, each movement needs to be thought out in relation to the letters beside it, then the word then the line above and possibly even preempt the line underneath. (I’ve got a great photo of a sentence that I wrote and I normally would have been quite happy with the outcome, well getting there and then Brody’s interpretation underneath plus the black lines of ‘of life has’ to show they are all the same height, the M etc) so good to see the differences. How did you find working at such a large scale? Sabine: The outcomes were fabric that we painted on directly. Everyone had brought their own fabric. I had very white(!) fabric and I must say that first brush stroke was a bit daunting! The scale was also intimidating but then also liberating. Kate: We worked at a large scale on both fabric and large sheets of Japanese Kozo paper stretched over a wooden frame. I loved working at a large scale, it is something I am starting to do more of. I find I loosen up and use my whole arm which produces better strokes. Barbara: We worked on 3m x 1m panels and stretched Japanese mulberry paper on them. This paper is incredibly strong and can take quite a bit. This was a group effort, six people per panel. The first time we all decided to have our own sixth. Working vertically was really strange for me so I decided not to concentrate on my letters but rather the process and technique. This technique Brody had experimented and worked out for himself and was happy to share the technique with us which was great and i think would be quite a new experience for most people there. Since I was doing both workshops with Brody some of us got to do these panels again in the second workshop and interestingly we treated it quite differently and were really much happier with out results. The group who were doing it for the first time, funnily did almost exactly what we had done the first time. What tools/mediums were you working with and how did they differ from what you work with in your everyday/routine calligraphy practice? Sabine: We were working with brush only no pointed pen. This was a complete departure from what I normally use. It took me several days to get the hang of using a brush. Kate: We were mainly using brushes, both flat and pointed as well as Chinese calligraphy brushes. I usually use nibs, ruling pens or other tools made from hard material as opposed to soft bristles. It was great to spend 5 days getting used to the flexibility of brushes, and how to manipulate the brush to create beautiful strokes. A simple tip from Brody on how to hold your brush at a different angle made a huge difference to the outcome. Barbara: Both workshops we used brushes, broad flat ones and pointed ones. This was different and I really enjoyed it, you get quite a different feel and need to hold and use the brush differently to a pen. So that too was a learning curve. On the above panels we used acrylic medium with gouache and then used a mixture of thinners, black house paint colour (but you can use any colour you wish) and varnish) it was a toxic smelling mixture but this worked against the first application of white letters and then the last process was using acrylic paints diluted to give the colour. Of course we had to let each stage dry thoroughly before starting the next stage. In the second, two day workshop we again used brushes but wrote on fabric. Some people did amazing lettering patterns. We had to divide our fabric into four and write quite differently on each quarter. Below are just two of my styles. I bought a really good quality linen fabric and washed it before I went to the workshop but didn’t iron it so this gave some interesting effects. I kept mine very monochromatic as I would like to use this fabric, since it cost so much and I don’t want to think it’s just going to sit in a box somewhere, I was thinking of making a summer skirt, watch this space though. Sabine: The brush marks gave great texture. Dry brush, wet brush and then using different letterforms to make up a mix onto the fabric. There was one collaborative piece that Brody started and we were encouraged to write in whatever script we wanted as long as the paint was black. This made for the most amazing work that I think the Society will be keeping. Barbara: Brody gave us exemplars of different styles of calligraphy from running brush to gothicised styles and what was so good was that he demonstrated lots during the workshop. In the first workshop along with doing the large panels we spent our time going through these exemplars he gave us and writing, with brushes, on a continuous roll of chinese paper. I found this really good because you could just move the paper along and keep going without the (subconscious or conscious) effect of tearing off a piece of paper and starting again. With the continuous roll of paper you never got the feeling of ending and beginning just keep going. The layering (picture above) was to create a lovely visual pattern without being conscious of doing so. To warm up you start your practice with a light colour and using the same space go over the previous letters (correcting/changing bits you felt needed it) but using a darker colour and so on building up the layers. Kate: We explored a couple of different techniques over the 5 days. We used a roll of Chinese practice paper to practice different calligraphic styles using different brushes and layers of colour. Not being constrained to a rectangle page allowed your practice to just flow along the roll. We also stretched large sheets of Kozo paper over wooden frames. The first layer we used white acrylic to write quite expressively, once this dried we added a layer of a black oil based medium, this revealed all the white text quite dramatically, which because of its expressive and collaborative nature became texture. When this dried we added acrylic colour washes. As a group we decided on a theme for our sheet and this influenced our colour choice. For example one was ocean themed so we used blue and teal. On the fabric we had to use a maximum of two colours. We used a variety of calligraphic styles and could divide up our fabric how we wanted. Brody wanted to see contrast between the styles, thick vs. thin, wide vs. narrow, and in the use of colour. I think it is fantastic you were able to collaborate on these artworks! What did you learn from each other or how was your work influenced by your collaborators? Sabine: I always find working with others on a collaborative work makes one less intimidated. We all come from the place of creativity and by working together the process of learning is very enjoyable. I learnt a lot from another calligrapher who I shared my workspace with as she had lots of experience using the brush. She showed me how to get the best from my brushwork. Kate: I learnt so much from my other class mates, the sharing of information about different tools, materials and work processes is invaluable. I was inspired by different styles and techniques from a number of people. And it emphasized the need to keep practicing so I am as good as them in another 20 years! Barbara: It was interesting, we really didn’t spend too long talking about it, we were all so eager to get going we launched into it. We helped each other along, guiding from the opposite side to the one the person was working on (does that make any sense). Things like this bit needs filling, this area needs larger letters and so the next person would take that on. It was good that we all new what colours we wanted to use and so decided that first and then came up with the theme and that determined the words (this of course is in the second panel as we were sooooo experienced). Like any group there were more and less dominant people and other who were just happy to go with the flow, but the best thing is it all worked out and since this technique was new to us all no one was precious we were all learning. What was the most valuable thing you took away from this years summer school in winter? Barbara: For me it was the fact that we were all there to learn, make mistakes and have fun and it really didn’t matter what level your calligraphy journey was at. It may have been different in some of the other workshops just given the nature of what they were learning but in Brody’s class we had fun even though it was hard work. It was great spending five whole days with people all as eager to participate (a lot of the class had done his workshop two years prior, lucky them). It was also really great watching Brody teach, he demonstrated a lot and was not the guru he could have been (which he totally is but), if he did something he didn’t like he had no hesitation to just say ’that was pretty bad’ and keep moving on. The other thing I took away was the fact, like all skill sets, you can experiment away but it is fundamental to know the basics. Write experimentally but with confidence knowing what you are doing or want to do. 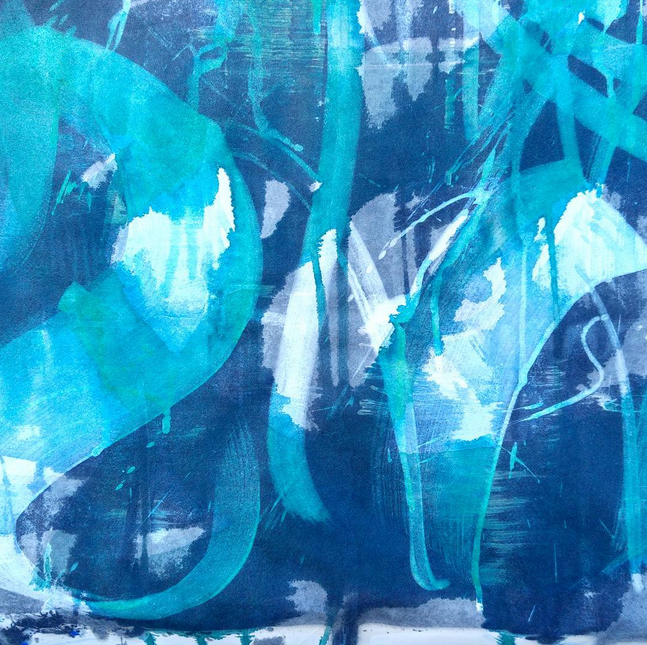 Sabine: Experimental works and hanging out with other calligraphers! Kate: That practice is so important! I improved so much over the 5 days from doing nothing but calligraphy. The muscle memory that comes from practicing is really key too, starting to remember the strokes of each letterform without having to refer to examples. Find out more about SSiW and the Calligraphy society of Victoria check out the society's site. Or connect with Barbara Ryan, Kate Hursthouse and Sabine Pickor via their website or follow along on instagram - these talented ladies are all doing beautiful work!